An unfortunate topic that was present throughout the entire lecture was the Nazi party. When they came into power, they made it so certain people, especially Jewish people, couldn’t really live. They had over 400 rules decrees and regulations against them which was horrible. The Nazi party also affected art and design. They had an exhibition called Entartete Kunst, which was made to hate on modern artist. They stole a whole lot of paintings from museums and sent 650 to the exhibition. Many modernist artists actually fled to America. Hitler just really hated this modernist art to the point where these artists felt threatened and probably were actually threatened. Another thing that happened was that there were a lot of propaganda posters against Nazis. 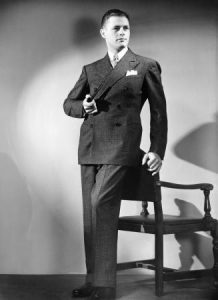 Men’s fashion during the 30’s was influenced by the economy. After the Wall Street Crash of 1929, also known as Black Thursday, there was a large economic decline, especially coming out from the Roaring Twenties. This meant the clothes were designed to be cheaper and more affordable than before. Suits were a big part of men’s fashion in this period. In the 1930s, a good figure was something that was really focussed on (like most periods) and their clothing reflected that. Men’s clothing generally had larger shoulders, thinner waists, and tapered pants. To get the square shape, shoulderpads were added to the suits. The sleeves were also tapered to add to the effect. During the mid 1930s, as life began to improve, clothing had to as well. People needed more professional looking clothes for a more professional looking image. There were a few suits that were popular in styles in this time. 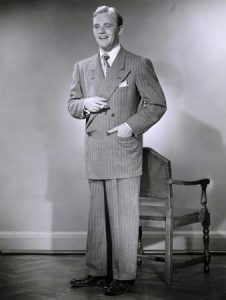 There was the London Drape which included longer tapered sleeves with smaller arm holes and looser in the upper arm area, the double-breasted suit which included a front panel that overlapped the other side, many buttons, and broad shoulders, and the Kent which had four buttons instead of the six seen in most traditional ones. 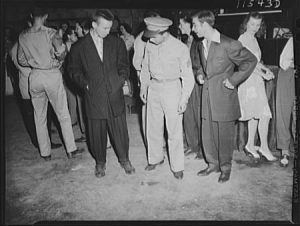 Aside from these more tradition suits, there was also the Zoot suit. It was very much influenced by jazz and was fashionable, but not as serious, which made it very popular. It was looser and longer and differed from the suits you’d think of at that time period. 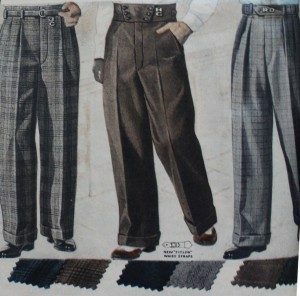 For trousers, they were a lot wider and the waistlines were higher. They usually had a deep crease line down either leg. For a more casual look, the pant legs were cuffed. Many of the clothing in the 1930s were either solid coloured or had plaid, stripes, or was checkered. 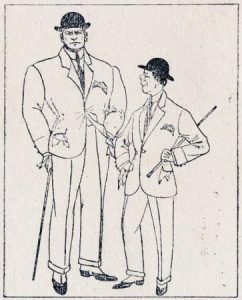 1930s Mens Fashion Guide- What Did Men Wear?